Learn all about H3 Digital, Thailand's first Smart Home company, established since 2004. 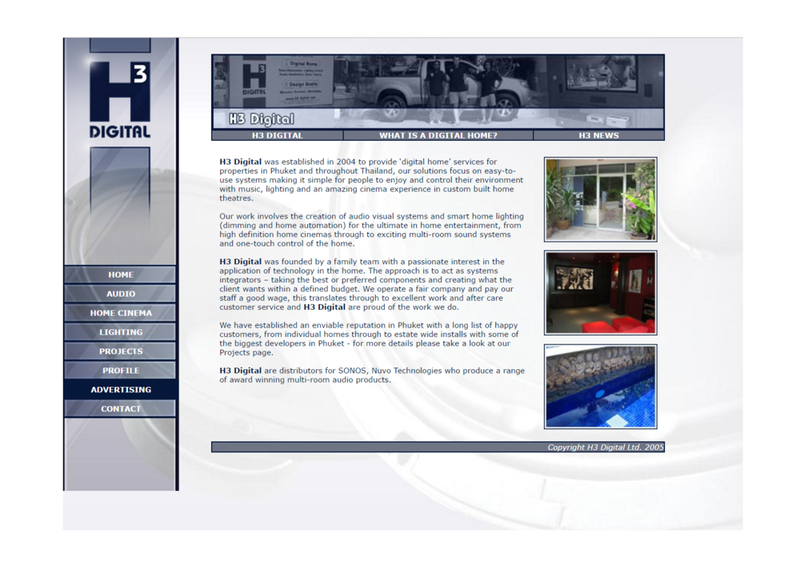 H3 DIGITAL was established in 2004 as Thailand's first smart home company. We are a family company and offer a one-stop Smart Home service in Thailand and SE Asia. We Design and engineer home cinema, multi room audio and lighting control systems. Our emphasis is on powerful, easy to use home technology that help bring your home to life; Great sounding unobtrusive music systems that are easy to turn on and off, change songs and volumes in every room (and outdoors, even underwater) of your home. Big screen home cinemas to watch with your friends and family in the comfort of your own home and easy to use lighting systems that are affordable and simple. We engineer Smart Home technology that is easy to use and simple to enjoy. Smart lighting that help set the mood just when you need it. Automation of the mundane (Home Automation). £12m villa in South Phuket, owned by the CEO of the worlds largest architecture firm. £16m villa in Phang Nga, Thailand's most expensive resale. Underwater speakers (complete with whale/dolphin noises). All of our systems are professionally designed and engineered - and then expertly supported by us. Ben Hobbs is the Managing Director of H3 Digital. THX and CEDIA certified, Ben has designed and engineered Smart Homes, Music systems and Home Cinema for some of the most luxurious homes in ASIA. Ben works hard to make your systems and rooms perform at their absolute best, using his in-depth technical knowledge to bring your home to life. Rob Hobbs is our Design Director. KNX and Nuvo certified, Rob's effective designs and easy to understand conceptual plans and AutoCAD diagrams lay a clear foundation for successful projects. Rob has 25 years computer design experience and 15 years designing specifically lighting control, home automation and multi room audio systems. Wirut Phadungphon is our Installation Director. 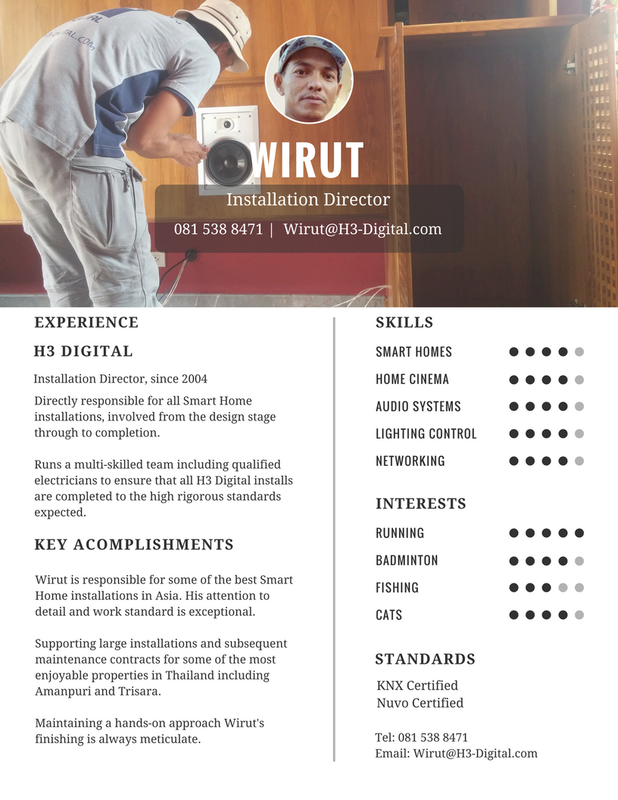 Wirut is KNX and Nuvo certified and is a professionally trained and qualified electrician. Wirut has been with us since the very start and recently been made a Director of the company. Meticulous in his work Wirut is in charge of making sure that all of our great designs are installed to our usual high standards. Our Laguna office opens in the Plaza Del Mar development and we become the first Asian Distributor for the Sonos wireless sound system, in the early days Sonos had a handheld controller with a wheel button and only sold the amplified ZP100 (then ZP120) Sonos Connect:Amp and the unamplified ZP80 (then ZP90) Sonos:Connect, ZP stands for Zoneplayer. On June 29th Steve Jobs and Apple releases the much anticipated iPhone, they sell nearly 2 million units in the first 6 months. An office move sees us transition from our Karon and Plaza Del Mar locations into a single custom built showroom in the Cherngtalay area. Key members of the H3 Digital team become KNX certified, passing examination in Singapore. Nuvo launch their Essentia audio system which is the worlds first Energy Star whole house audio system, consuming less than 1 Watt in standby mode. Music fans worldwide are saddened as Michael Jackson, the King of Pop dies on the 25th June. Managing Director Ben Hobbs passes the CEDIA EST II and THX training courses in Australia. CEDIA is the Custom Electronic Design & Installation Association and is seen as the Gold standard for custom audio visual installation. Ben also passes the worlds first Home Cinema Master Class, attending in 2011 in Beijing, his Cinema Design passes the last stage of examination with Rich Green (Steve Jobs and Larry Ellison Home Cinema Designer) and Anthony Grimani (Inventor of Dolby/THX Surround). Facebook goes Public. Big changes see a new logo which is spray painted onto our cars by Bangkok Graffiti Artist MisterBows, 2016 also marks the start of building our new office which is on 0.75 Rai near the Alan Cooke cricket ground. It's container architecture, we love the idea of recycling/upcycling, the land was previously a rubbish dump and a Burmese work camp before we rejuvenated it. Musical Artists Prince & David Bowie die, the UK chooses to exit the EU (Brexit) and Donald Trump wins the US Presidency.